Do you identify as nonspeaking? as nonverbal? both? or neither? DJ: I am nonspeaking. I am not nonverbal. In fact, I am highly verbal. I don’t use my body’s voice—my vocal chords—as my primary way of communicating. I think I will learn to talk, but I use other means to communicate because at this point it’s not easy for people to understand what I’m saying. I might look “dumb,” but I’m not. I’m just nonspeaking. Speech is assessed as not important by me because it uses a lot of my body, and I don’t have it all under control yet. For now, I like to sign and to write my ideas. I am verbal. If I weren’t, I couldn’t be writing to you right now. I have a lot to say, and I use my written language to say it. I am verbal. I can message my ideas but not say them out loud. I am verbal. 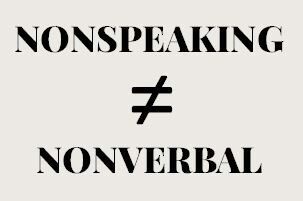 So why is it important for people to quit equating nonspeaking to nonverbal? DJ: Nonspeaking doesn’t mean I have no ideas or no way to communicate them. Nonspeaking doesn’t mean I can’t learn to read or write like everyone else. But I can’t if you don’t teach me how. And calling me nonverbal is like saying I can’t learn to read and write. Sometimes I look sandy, but I’m not. (Sandy is a word I use to describe when I meditate in my mind and lose my language.) Assume you are me and you sanely learn to read and write. Not nonverbal. DJ: I think people use it to desert hope for nonspeaking people. It’s part of the idea of a spectrum or of a weeding out classification. And it’s unjust because it’s segregating my people into classrooms of easy lessons. Deej, an America Reframed documentary film received a 2017 Peabody Award! DJ Savarese: Visit my website at Listen2Us, and keep visiting it all summer as I finish it. Ask yourself how you can possibly know your child has an intellectual disability if you aren’t able to understand what they know. Try all kinds of communication with them: photographs, words, AAC, sign language. @kmcritchie This is a new tweet.